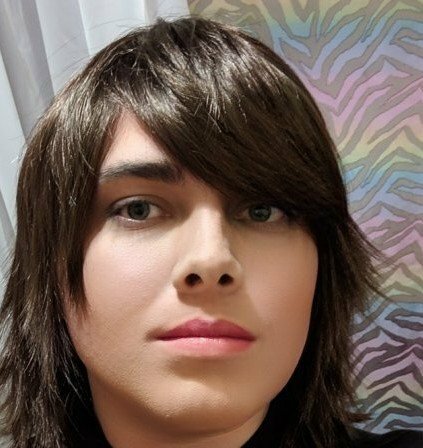 My wife has been helping me with my make up for the past couple weeks and I think I'm starting to get the hang of it. I still feel like my jaw looks really pronounced but I can deal with that. I am wearing a terrible wig in the photo. My wife thinks Im not passable yet (but she also says she is still adjusting to this stuff). I think I'm close to passing. But I would like outside opinions and tips if anyone feels like sharing. I think that people we know will see through makeup and see our underlying features so it may take time for your wife to see you as anything different, even when being objective. My opinion is that, taken in isolation, you do have androgyne features so could be taken as either male or female. Really it is other clues which assist or work against things. If you were smiling you would probably look more feminine. The clothes you wear and you mannerisms would have a large effect. I like the wig. You remind me of a girl I knew at school. She had similar hair. It's good your wife is helping.